If you wear prescription glasses but you’re not jazzed about the idea of schlepping off to a physical store to buy them, we’ve found a website you’ve got to check out. 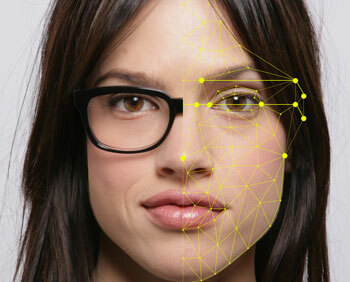 Called Ditto, it uses your computer’s webcam to digitally capture your face to create a virtual model. You can then virtually try on designer eyeglasses and sunglasses and see what they look like from straight on as well as viewed from both sides. It’s slick. After giving the platform permission to use your webcam, the site asks you to move closer to your webcam until you can see your entire face filling a circle on your screen. After detecting that you’ve done so properly, Ditto then tells you to slowly turn your head to the sides so it can record a 180-degree view of your face. The next part seems a bit weird—you have to hold a credit card up to your forehead. Ditto has you do this so it can ensure that the size of the eyeglasses you try on are at the right scale for your face. The only thing that hung me up when I tried this process was my mug wasn’t evenly lit, so I had to plug in a lamp and set it on my desk to get Ditto to work. From there you only have to answer a few questions to narrow the selection of frames, including those regarding your gender, budget and style, such as vintage-inspired, traditional or edgy. Then, voilà—in less than a minute you’ll get dozens of choices to try on. Designer brands Ditto offers include Ray-Ban, Illesteva, TAGHeuer, Jason Wu and more. And if you can't decide between two glasses you can see how you look wearing them side by side, so in that way Ditto is actually better than trying on real ones in a store. 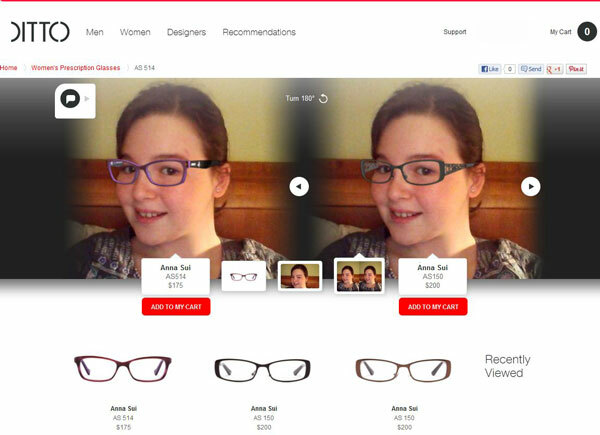 With Ditto, you can compare two pair of glasses side by side. Not only does the site offer free shipping and returns (which is great if the fit bugs you once your glasses arrive via UPS), but before you buy a pair you can e-mail others a link they can use to see your Dittos and weigh in on which frames look best on you. Want to poll a larger audience? You can also post your Ditto on Facebook and get all your friends’ input. While Ditto doesn’t accept regular health insurance, you can use a health savings account or flexible spending account to pay for the prescription eyewear you buy. The company says you also might be able to get reimbursed by your health insurance provider by using Ditto as an out-of-network provider. To submit your prescription to Ditto you can enter it on the website when you check out, upload a photo of your prescription or provide your doctor’s contact information, which the company will use to track down your numbers itself. Ditto must verify prescriptions by contacting your ophthalmologists directly if you live in one of 22 states that requires it. Currently you need to use a computer that has a webcam to use the site, but Ditto says iPad and mobile apps are coming soon. Ditto works on Firefox, Safari, Chrome and Internet Explorer 9 and higher and requires that you have Adobe Flash 10 installed on your machine. ما چه جوری می تونیم این صفحه را فارسی ببینیم.